This sounds strange for its unfamiliar name. It is “Tino Tino” as we call it in our local dialect. Its origin is traced in Japan. In China, this is called as Chinese Lantern berry due to its figure and shape which look like a small lantern. This is grown in Asia and our country Philippines which is part of Asia. It is also grown in Southern Europe. This berry had played so much on the way we were growing up especially when we were in our childhood days. In the weekend since we didn’t have classes, my peer group gathered around in a place where we used to meet late in the afternoon. When we were completed we proceeded to our hangout in vacant land just a stone-throw from our residence. We rolled to the grassy ground then got up and chased each other. When we got tired we looked around for a tall grasses, pulled them and threw or scattered around. Then we rested. While resting, we picked the berries of “Tino Tino“, pressed them to our forehead to let its covering burst. Or we collected a handful of them, rolled its shiny green rounded fruits or berries like a marble. Its ripen one, we ate them for it tasted like a sweet-sour as it broke into our mouth. We couldn’t forget this kind of plant berry in our life. It contributed a lot on how we grew up as we played in the prairie or in the meadow. These berries grew all over. Nowadays, you could hardly find them. A week ago while I was taking a 30-minute walk to the nearby farm, I came across with these berries growing along the grassy road near the canal. They were hardly seen for they were covered by a tall cogon grass. I had spotted them for I had seen its fruits shaped like a lantern. Everyday I kept on checking it up until I was able to harvest some of its ripen berries. As adopted by Chinese, it has a medicinal benefit to human. As a plant bearing berry, it is rich in vitamin A and C. It gives a small amount of phosphorous, calcium and iron. It improves metabolism. It has a diuretic and laxative effect for it is rich in pectin which prevents constipation. It is also a good source of antioxidant superoxide dismutase, an anti-inflammatory property which treats arthritis according to study. It is also studied that it could inhibit female fertility. This berry may use as fruit desserts, savory sauce for turkey, pork, fish or other meat. It could also be used for a pie filling. 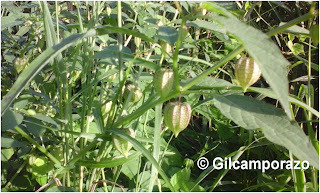 “Tino Tino“, Chinese lantern berries, or Physalis Alkekengi is a plant-bearing berry which has contributed much of my growing up. It is a reminiscence of my childhood friends.